Recruit your friends & family to join Firefighters Community Credit Union! When they make their debut and become a member here, you’ll each receive $25*! Oh, and don’t forget to fill them in on the awesome perks, services and products offered to “members only”! Ask for a Member Referral Card from a Teammate in any branch. Give your referral card to a friend, colleague or family member you think could benefit from membership! 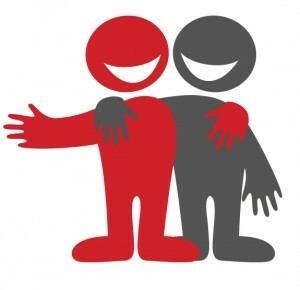 Your friend brings their card to any FFCCU branch and opens their new account with a balance of at least $50. You, the referring member, cannot be primary or joint on the new member account. You will receive your $25 reward within 10 days of your friend opening their account. When your friend’s account stays open for 60 days and maintains a minimum balance of $50 they’ll receive a $25 reward! Remember, we’re not just for firefighters. Membership is open to everyone who lives, works, worships or attends school in Cuyahoga, Geauga, Lake, Lorain, Medina, Portage, and Summit Counties. Get more information about membership qualifications by clicking here. 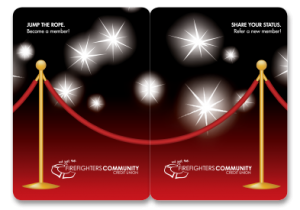 *Membership at Firefighters Community Credit Union (FFCCU) is open to everyone who lives, works, worships or attends school in Cuyahoga, Geauga, Lake, Lorain, Medina, Portage, and Summit Counties. Subject to membership approval. A minimum opening deposit of $50 into an account is required from the new member. Referring member cannot be Primary or Joint on the new member account. Money will be credited to referring member’s account within 10 days of new member account opening. Money will be credited after 60 days to new member account if the minimum required $50 balance has been maintained. By accepting the $25.00, the referred new member acknowledges that the referrer will be notified of their new membership. FFCCU employees and the member they refer are not eligible to receive a $25 member referral bonus. Reward amount will be reported on IRS Form 1099-INT for new member and referring member. All rates, terms and promotions are subject to change. In the event that more than one original member refers the same person, the qualifying incentive will be paid to the original member named on the referral’s application. This institution is not federally insured, by member choice.